40l.lilac-rose/greenish canc.dott. "2" (=Piraeus, typ.I). The so-called "SOLFERINO" (Vl.49b, SG.37a, Mi.37F). DROSSOS certific. (1979), G.BUHLER certific. (1979) & M.TSERIOTIS certific.(1990). 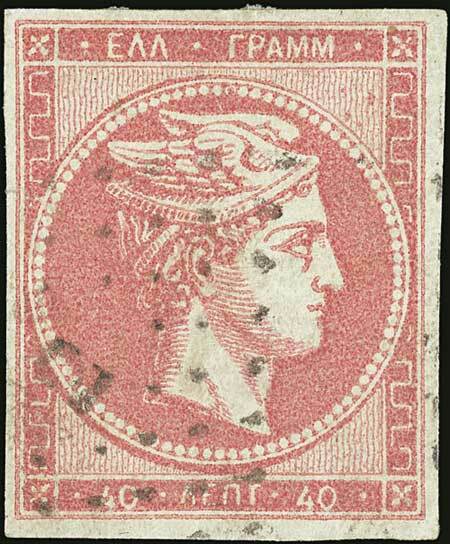 The latter says: "I have examined all 12 examples of this stamp known to me and, to my opinion, this copy is the finest looking af all". One sheet issued (color error) & only 12 are known to exist. All circulated by Piraeus P.O.("2"). Extremely rare & superb.